Lol te de a de um, Lol te de a dum. We return this month to this wonderfully obscure and fun-to-sing variant of “Whiskey in the Jar” recorded in 1924 from Akeley, Minnesota singer Reuben W. Phillips (see N.S. Sep. 2014). The Lost Forty recently arranged Phillips’ version of Lovel and the video above shows us performing it at the beautiful Stone Saloon building in St. Paul. I am thrilled to announce that the original field recording of Phillips singing Lovel, along with many others, is now online on the new Minnesota Folksong Collection site! Visitors to www.minnesotafolksongcollection.org can access (for free) over 40 field recordings of Minnesota singers recorded in 1924. Many of the songs featured in Northwoods Songs over the past four years appear in the collection. The site is currently relatively bare-bones but over the next few months I will be adding features to help encourage visitors to learn songs from the collection and to learn more about the Minnesota-based source singers. 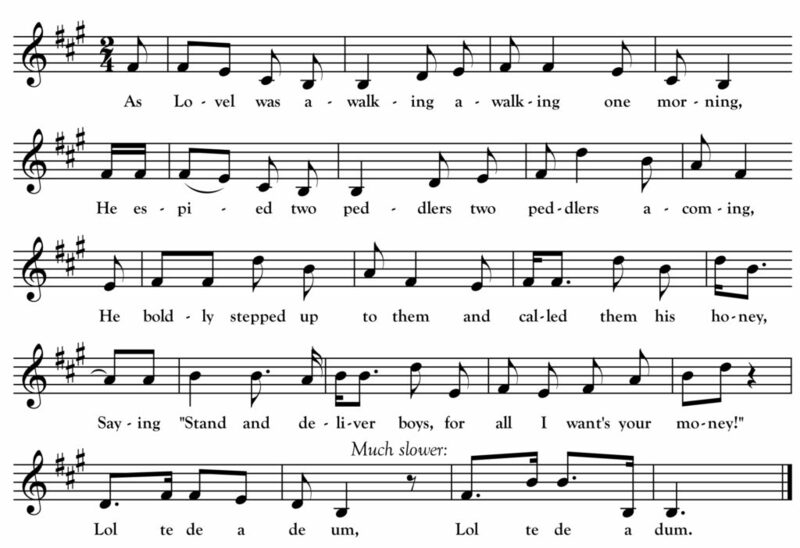 The site does feature sheet music transcriptions of the song melodies (a labor-intensive feature for me to create but, hopefully, something that helps users decipher the very low fi recordings). When folklorist Robert W. Gordon recorded Minnesotans Reuben W. Phillips and Michael C. Dean, he typically only captured one or two verses of each song—rationing out the valuable space on his wax cylinders. Luckily, both Phillips and Dean supplied Gordon with complete written texts for most of the songs they sang. I have combined their texts with the field recordings on the Minnesota Folksong Collection site just as I have done above and in previous Northwoods Songs. Phillips’ handwritten manuscript of song texts is full of many nonstandard spellings of words which I have altered to more standard spellings above and on the website to help users access the texts more easily. I have also opted to shift some of the transcriptions into keys I feel are more suitable for sight reading. I would love to hear some feedback from Northwoods Songs readers regarding the functionality of the new site! Please check it out at www.minnesotafolksongcollection.org and drop me a line to let me know what you think. This activity is made possible by the voters of Minnesota through a grant from the Minnesota State Arts Board, thanks to a legislative appropriation from the arts and cultural heritage fund.